From Table 1 of Montzka el at. , except for CHC1, which is from Table 2.1 of WMO , ;l CI atom abundance = the tropospheric abundance of the molecule times the number of CI atoms in the molecule. Note that we have multiplied the abundance of each molecule by the number of chlorine atoms in the molecule to determine the concentration of chlorine atoms. Species not listed in Equation (4.3) make up only a few percent of CO,. Hereinafter, we will refer to the chlorine-bearing organic molecules as CC1V. Once in the stratosphere, CC1, is destroyed primarily through photolysis by ultraviolet photons, with a minor fraction of loss occurring through oxidation. The local lifetime 1/L for several CC1, species, as well as N30 and CHt, is plotted in Figure 4.2. In general, the local lifetime decreases from decades in the lower stratosphere to weeks or months in the upper stratosphere because the abundance of ultraviolet photons and oxidizing radicals both increase rapidly with altitude. 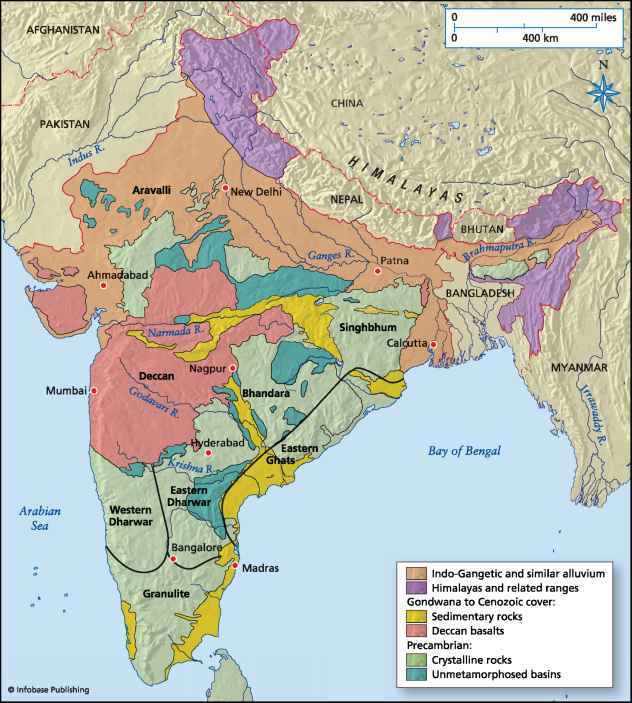 Note that lifetimes of species that are destroyed primarily by oxidation (e.g. CH4) decrease more slowly with increasing altitude than the species that are destroyed primarily by photolysis (e.g. N,0, F12, F11). Figure 4.2 Daytime-average local photochemical loss lifetime 1/L versus pressure for several long-lived species. Values are an annual and global average (from the Goddard two-dimensional climatologica) circulation model [731). weights of 100 or more, while the average molecular weight of air is 29. 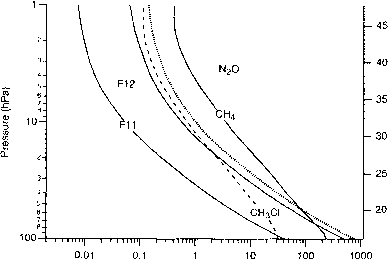 Thus, CFCs are heavier than air and, the argument goes, such molecules should stay near the ground. Fortunately, this line of reasoning is false. It is true that heavier molecules do sink toward the ground while lighter molecules rise towards the top of the atmosphere. Opposing this separation, however, are mass-independent mixing processes that tend to homogenize the atmospheric column. Whether the atmosphere separates into layers on the basis of mass is determined by the relative time-scales for these processes. For the atmosphere to separate into layers based on mass, molecular diffusion must be the dominant process. It turns out that this process is extremely slow. The kinematic viscosity of air at the surface is v « 0.2 cm2 s We can estimate the time-scale for air to diffuse through a scale height (// ~ 7 km), which is approximately the height of the troposphere, as Il'/v = 8x 104 years. Thus, if undisturbed by other processes, the atmosphere would diffusively separate into layers by mass on a time-scale of tens to hundreds of thousands of years. Opposing molecular diffusion arc mass-independent mixing processes such as convection in the troposphere and gravity-wave breaking in the stratosphere. In the troposphere, bulk mixing processes are rapid, homogenizing the troposphere on a time-scale of a month or so. Transport into the stratosphere occurs on a time-scale of years. Thus, these processes mix the atmosphere much fester than it can diffusively separate. The net result is that CFCs do not stay near the ground but are transported into the stratosphere, where they are destroyed. It should be noted that the kinematic viscosity is inversely proportional to density. Thus, at 120 km, where the density is about 10 7 of the surface, the time-scale for molecular diffusion through a scale height of 7 km is about // 7 v — 8x10 years = 3 days. Under these conditions, molecular diffusion can become important, and the atmosphere does indeed begin to separate into layers based on mass at these altitudes. A few paragraphs earlier we wrote "Fortunately, this line of reasoning is false." Why is it fortunate that the atmosphere does not separate by mass'.' Argon (atomic weight 40), for example, makes up about 1% of the atmosphere. If the atmosphere did separate by layers, Ar would make up a layer several tens of meters thick near the ground. Since we cannot breathe Ar, it is indeed fortunate that the line of reasoning presented at the beginning of this section is false. Loss of CCly through photolysis and oxidation is exactly compensated for by an increase in the abundance of Cly. 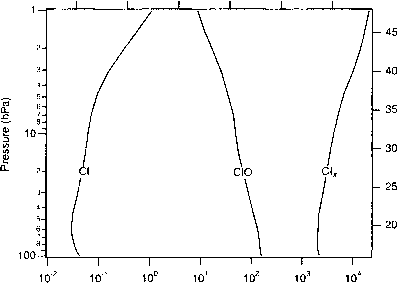 Thus, the sum of [C1J and [CC1„] in an air mass remains constant over time. ClOOCl is only important in the polar wintertime lower stratosphere, and we will therefore ignore it until our discussion about polar (), loss in Chapter 7. Additionally, the destruction of CC1> also releases fluorine atoms. The chemistry of fluorine will be discussed later in this chapter. Ci, can be thought of as a "family within a family". The lifetime of CI, is much longer than the lifetimes of CIO and CI for the same reason that the lifetime of Ot is much longer than the lifetime of O, and O. Therefore, on time-scales that are short compared to the lifetime of CI,, the abundance of Clx remains constant, while the CIO and CI molecules are rapidly interconverting. On time-scales that are long compared to the lifetime of CI,, CI, will be interconverting with the other members of Clv. CI, comprises the active components of Clv—i.e. those members of Clv involved in the catalytic cycles that destroy O,—and is generally referred to as "reactive" or "active" chlorine. CI, is also referred to as CIO, or CI*. The remaining members of Cly (mainly HC1 and C10N03) are reservoir species.